Some compounds/alloys of manganese are magnetic. Mn2p peak has significantly split spin-orbit components (Δmetal=11.2eV). 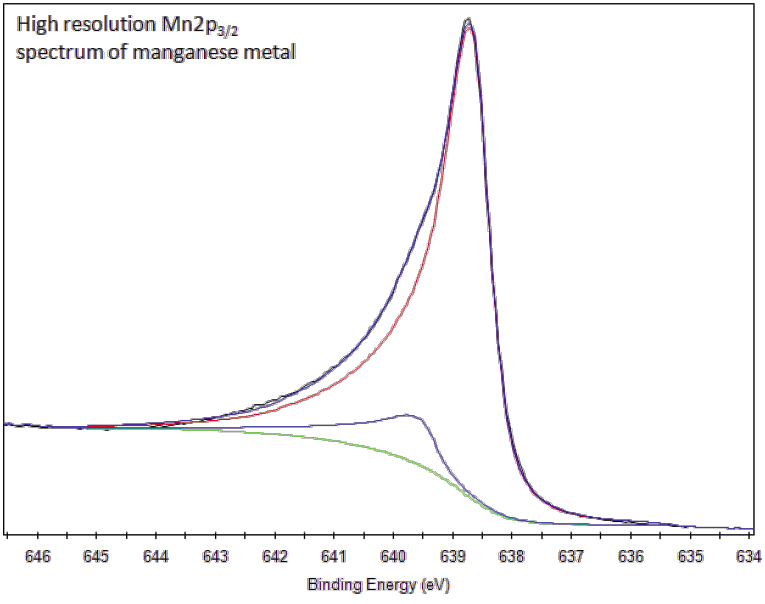 Mn2p peaks have asymmetric shape for metal. Mn oxide peaks are significantly shifted to higher binding energy than the metal. A well resolved Mn2p spectrum for metal shows multiplet splitting. 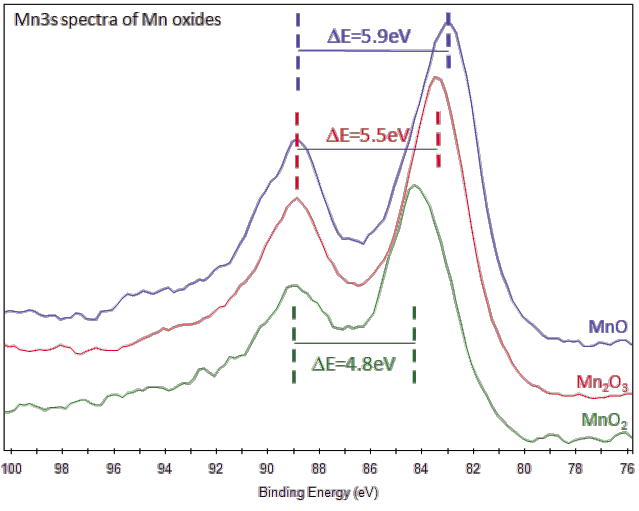 Second component (shifted by 0.9eV from main peak) can be neglected when fitting mixed oxide/metal spectra. Method for chemical analysis of Mn oxides. Mn2p peaks for Mn oxides have many multiplet-split components, similar to the Cr2p region in chromium oxides. MnO2 has a much narrower Mn2p3/2 peak compared to MnO or Mn2O3. Also has an identifiable shape at the top of the Mn2p3/2 peak. 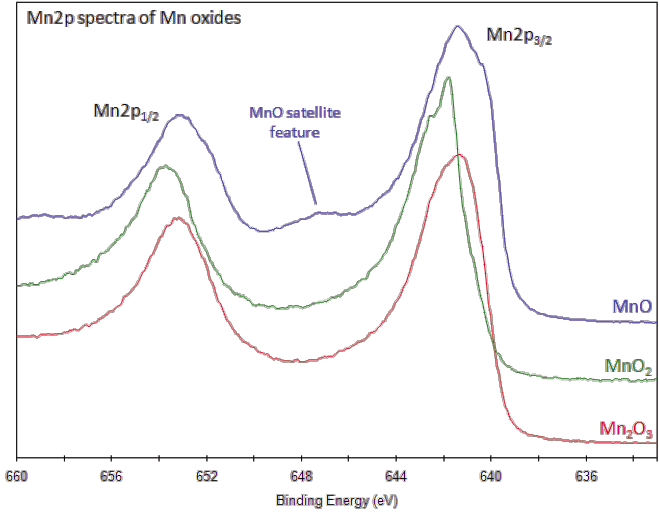 Possible to distinguish Mn oxidation states using Mn3s peak. This peak has two, multiplet split components. Caused by coupling of non-ionized 3s electron with 3d valence-band electrons. Magnitude of peak splitting is diagnostic of oxidation state. MC Biesinger et al., Applied Surface Science 257 (2011) 2717-2730. Manganese is used in the same disciplines today as it was in prehistoric times. Used in iron and steel production, it was found in iron ores forged by the Spartans. The Egyptians and Romans used manganese compounds to add or remove color from glass. Manganese compounds can color glass an amethyst color and produce the color of the gemstone amethyst. Most of the world’s deposits of manganese are found in South Africa and Ukraine. 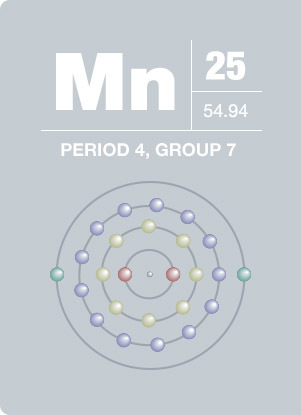 Manganese also exists in nodules on the ocean floor, however no economical method of harvesting them has been found. Potassium permanganate (KMnO4) is commonly used in laboratories for its oxidizing properties.